A zither is a musical instrument that has 30 to 40 strings, with each string tuned to a specific pitch. Tuning the instrument may seem like an overwhelming task, but do not get discouraged. 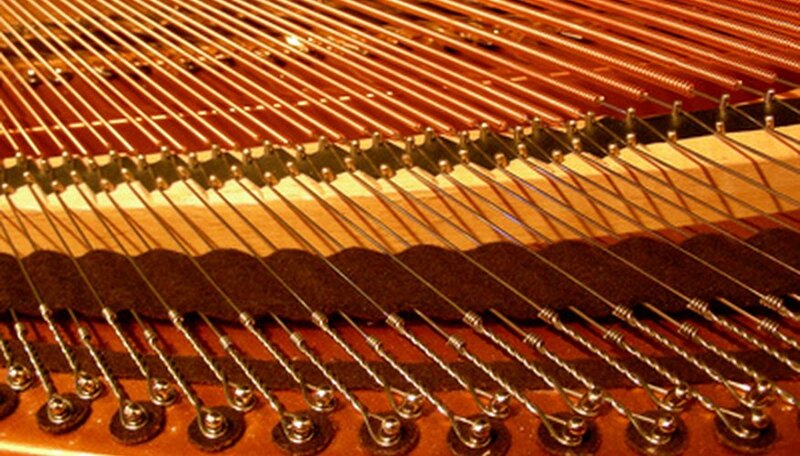 With the use of a chromatic tuner, tuning a zither is a simple activity. Place the zither on a flat surface. The strings with tuning pegs should be closest to you. Position the tuner so it is close to the sound hole of your instrument. You can hold the tuner directly over the sound hole, place the tuner on top of the soundboard or put the tuner next to the instrument. Tune the first five strings (the ones with tuning pegs), which are tuned to the following notes: A, A, D, G and C. Pluck the string and allow the tuner to pick up the sound. Turn the tuning peg clockwise to loosen the string or counterclockwise to tighten the string. Adjust the string until you can pluck the string and the tuner shows the string is tuned to the correct pitch. Tune the next set of strings, which are the accompaniment strings. The strings are tuned to the pitches E-flat, B-flat, F, C, G, D, A, E, B, F-sharp, C-sharp and G-sharp, starting with the string closest to the first five strings. Use the tuner as mentioned in Step 2, and use the tuning lever to adjust the tuning pegs for these strings. Tune the next set of strings, called the bass strings. They are tuned in the same order as the accompaniment strings, except they are an octave lower than the accompaniment strings. You will also use the tuning lever to adjust these tuning pegs. Tune the last set of strings, which are the contrabass strings. There can be as few as three or four strings or up to 13 strings. The first of the contrabass strings is tuned to F, and the following strings are tuned downward chromatically. The tuning for the contrabass strings is: F, E, E-flat, D, D-flat, C, B, B-flat, A, A-flat, G, G-flat and F. Use the tuner and tuning lever as you have for the accompaniment and bass strings. You may choose to tune all of the strings again after tuning the first time. The second tuning allows for some fine-tuning and adjusting and strings that may have slipped out of place.